Allen McGee has been a trout fly fisherman for nearly 25 years. He specializes in both traditional and progressive soft-hackle flies and their fishing methods. 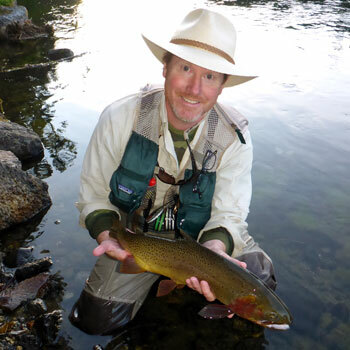 Allen is an author, fly designer, photographer and nationwide trout angler. He is mainly interested in innovative soft-hackled fly patterns incorporating traditional and modern materials into modern soft-hackle flies, sometimes using new tying methods, designed for species specific presentation methods that simulate the naturals' behavior, action and movement. He has designed flies for Montana Fly Company and is now designing flies for Solitude Fly Company and is a member of the Regal Vise pro staff. He also is a founding member of the International Brotherhood of the Flymph. Allen wants to push what soft-hackled flies are thought of being used for and how they are fished. He believes that soft-hackled features can be incorporated into all life stages of insects and other food items of the trout's diet. He is the author of Tying & Fishing Soft-Hackled Nymphs, Spiders to Flymphs: The Evolution of the Soft-Hackled Fly and Fly-Fishing Soft-Hackles: Nymphs, Emergers and Dry Flies and is currently working on a new book. His articles and photography have appeared in many popular fly-fishing magazines. Allen lives in Atlanta, Georgia. His local waters include the mountain streams and tailwaters of North Georgia, North Carolina and Tennessee. Allen also fishes regularly in the Rocky Mountain west, midwest and the throughout the East Coast streams. He has also fly fished for trout extensively in Ireland and South Korea. He believes that more trout streams you fish the more you begin to really understand the trout and their relationship to the water and insects, as every water is different and gives you new experiences that you can learn from and develop your skills. Allen can be found presenting and demonstration fly tying at many fly fishing events and clubs throughout the year. His website is http://allenmcgee.blogspot.com/.